The statewide Way to Go Commuter Challenge kicked off in Hinesburg on Monday, as transportation and legislative officials officially launched a new bus service along Route 116. Way to Go Week is a statewide initiative that encourages Vermonters to find an alternative to commuting alone in a car. 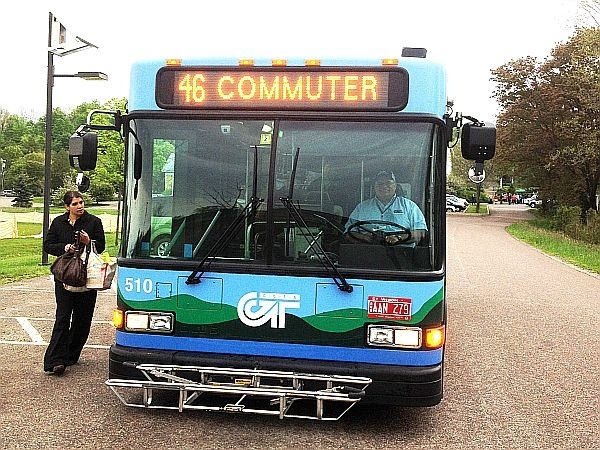 The goal is to share rides, ride a bike, or use public transportation like the new bus route that will ferry passengers between Middlebury and Hinesburg, and Hinesburg and Burlington. Deb Sachs is with the Way to Go Challenge. She says even people who live in rural areas can find ways to get to and from without using their cars. "One day a week is a 20 percent savings on your transportation costs," Sachs said. "We’re sending over $1 billion out of state just to buy fuel for their vehicles. The easiest solution is to sign up online. That’s connectingcommuters.org, where you can actually be matched with another rider. Rural Vermonters really should sign up. And the more Vermonters that sign up the more we’ll be able to match with others." Way to Go Week lasts through Friday. Last year, organizers say they had more than 3,000 participants and saved more than 350,000 pounds of carbon dioxide.